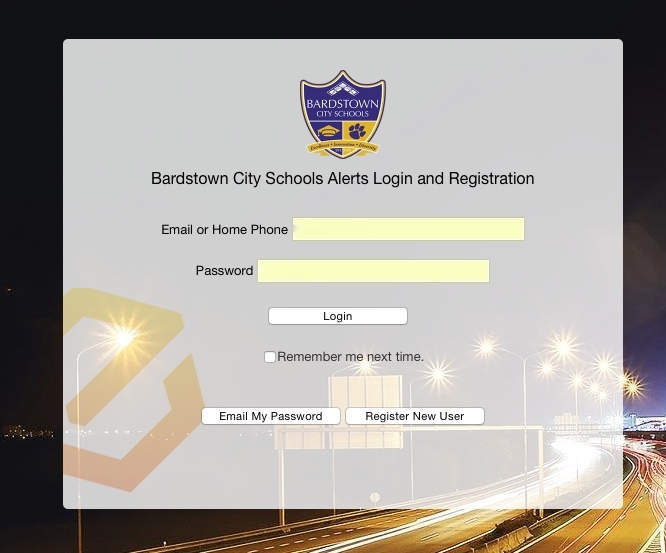 Bardstown City Schools uses an emergency alert communication system called Instant Connect to announce closings or delays due to weather. Instant Connect is a new alert notification system that allows you to choose how you wish to receive alert communications. You must register for this service and you can choose how you wish to receive these communications – text, e-mail, or phone call or a combination of the three. You decide which is most convenient for you. While Instant Connect will primarily be used for district-wide situations such as the closing of school due to weather, the individual schools may use it occasionally as well. The One Call system will no longer be used when Instant Connect goes into effect. You will use either your primary phone number or e-mail address to log in. This is the information you have provided to us in the past for Infinite Campus. If you need to update your information in Infinite Campus in order to complete your registration for Instant Connect, please contact your child’s school office. They can make the necessary changes for you. 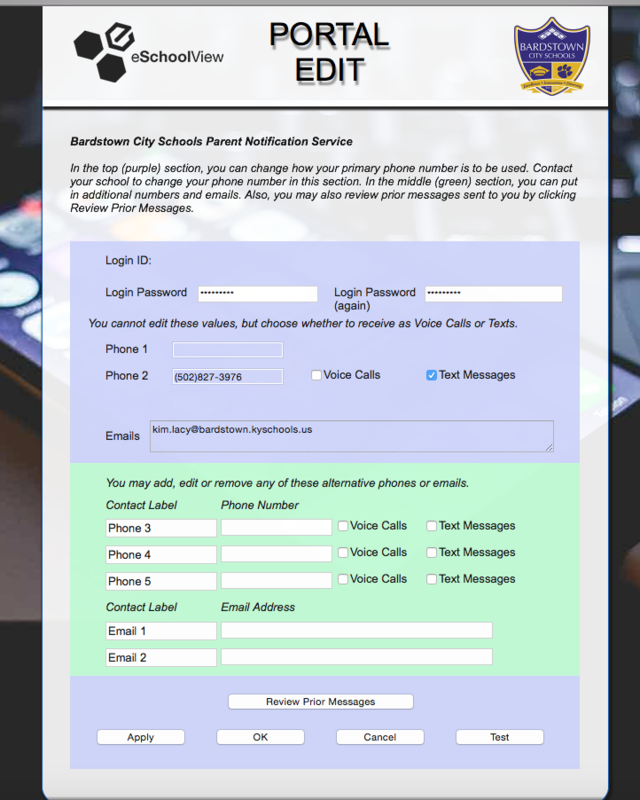 We are so excited to be able to provide both of these communication services to our Bardstown City School family. Your screen will look like this. 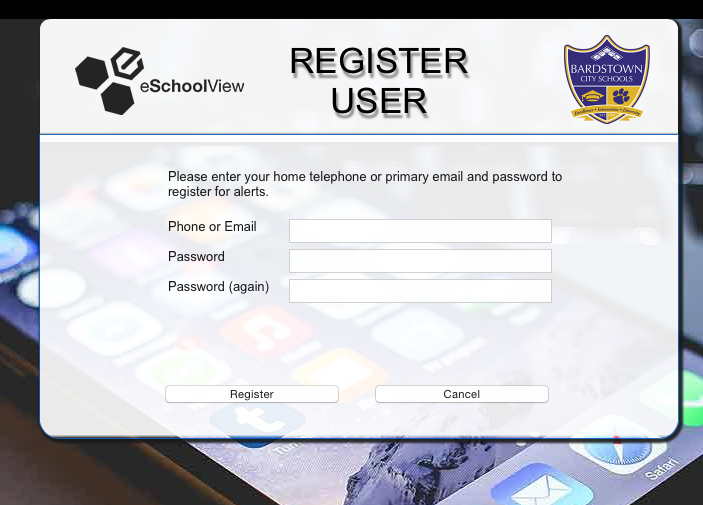 Enter either your e-mail or primary phone number and a password and click Register New User. Enter your phone or e-mail and password again and click register. The Contact Information you have provided that is currently in Infinite Campus will show here. Notice, you can’t change the information in the top purple box. So, if that information is incorrect, you must contact your child’s school office so they can change the information in Infinite Campus. Once corrected information is entered by the school, the new information will show up the next day. You may then continue with registration. If the information is correct, you can make selections of how you wish to be contacted by phone – you may choose either Voice Call or Text Message or both. In the green box you can add additional phone numbers and e-mail addresses for people you want contacted and also choose how those phone numbers are contacted. For instance, if your child is with a grandparent before school and you want them contacted regarding school closings due to snow, enter their information. When finished making changes, click apply and then click ok. You will get a message that says your change is complete. At this time, it is a good idea to send a test message (button on bottom right) to be sure you are contacted as you have indicated. Remember, this is primarily an emergency notification system for school closings or an emergency impacting a particular school during the school day, etc. Schools may occasionally use it for general notices that need to go to a broad school audience. You have the opportunity to go in and change your preferences at any time by logging in using your contact information and unique password. If you have problems with the process, please contact your school office. Thank you for registering for Instant Connect!